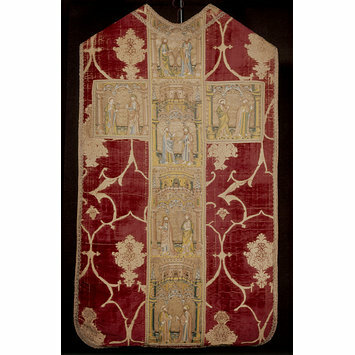 Chasuble made of crimson velvet, which pattern is achieved by covering the areas that would otherwise be left voided (clear of the pile warp, with the ground weave clearly visible) with supplementary (brocading) gilt-metal weft. The main motifs are additionaly enriched and enchanced by creating the boucle loops with the supplementary (brocading) weft. 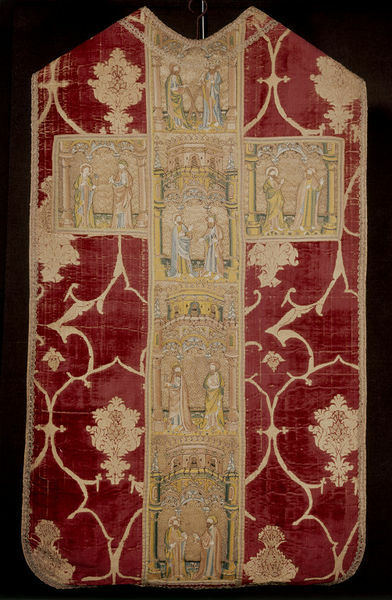 The orphreys are linen embroidered with gilt metal and polychrome silks in split stitch and couched work, additional seed pearl decoration. The orphreys are embroidered with pairs of saints beneath elaborate architectural canopies. Unidentified prophets are paired with saints including St Simon, St Bartholomew, John the Evangelist, St Andrew, St James the Less and St Thomas.